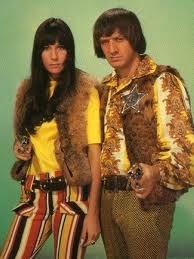 Sonny and Cher were a husband/wife singing duo. Cher was cooler than cool with her long, silky black Cherokee hair. Grab the iron and the ironing board, girls, because everyone wanted hair like that. Yes, I did say iron and ironing board – it was light years before the flat iron would be invented. So you would lay your hair on the board with a light towel over it and iron it like, say, a pair of pants until it was straight. Odd concept, I agree. But that’s what we did in the “olden” days. Either that or you would set your hair with 3 inch beer-can-sized rollers. And those clothes…tied-dyed hippie garb with Indian patterns, faux fur, leather and so much fringe. Cher wore it well – she was tall and confident and casual and not bothered by the fanfare that surrounded her. She was funny in a sarcastic kind of way, and everyone wanted to be like her. Sonny was her short, older husband with a smile too broad and a “look at me, not her” aura. He was dominant and controlling, but Cher had an “I don’t give a crap” attitude and flung insulting one-liners at him like meteorites. Sonny was always trying too hard and had a terrible, croaky, frog-like voice. Sorry, Sonny, but it was true, although you were likeable in a cuddly bear kind of way. May he rest in peace. Sonny and Cher were the rage of the time, and “The Beat Goes On” was one of their biggest hits. And such stirring lyrics – let’s take a “then and now” look. Charleston was once the rage (uh-huh – you’re in charge of singing the “uh-huh” part after each stanza like they did. ): Has everyone heard of the Charleston? It was the hot dance during the 1920’s flapper era? (And, no, I didn’t live in the 20’s. I’m not that old. No offense to those who did.) I guess the dance rage today would be running man, although when I try to perform it at weddings or social gatherings, my children run away from me and pretend they don’t know me, so I guess I’m not that good at it. History has turned the page (what do you say?…uh-huh): Sonny and Cher didn’t last on the next page of history. They went their separate ways, eventually divorcing but were successful doing their own thing. Cher became a mega star with movies and awesome Las Vegas acts (oh, yes, now you know who she is…). Sonny entered politics as a mayor for Palm Springs and then went on to become a member of the US House of Representatives. Go figure. He died from injuries in a tragic skiing accident in 1998. God rest him. Who will last from this era? I’m pretty sure it won’t be Nicki Minaj but maybe Adele? I’m hoping Gavin DeGraw because he’s the type of guy I would have went for had he lived in the 60’s, and he wears a hat well. Check back with me in 20 years and we’ll see. Mini skirts the current thing (uh-huh… No, I don’t know why they sung uh-huh after each phrase. I guess it’s sort of a mystery, like why the Beatles sang “yeah, yeah, yeah” after every phrase in “She Loves You.”): Mini skirts are out, and maxies seem to be trending at the current moment. Teenybopper is our newborn king (uh huh…just do it! ): Not even sure what this line means. Neither does Google. But today’s youngest leader would be Kim Jong-un (29 years old) of North Korea. The grocery store’s the super mart (uh huh): Yes, we have the super marts galore still today: Walmart, Costco, BJ’s, Sam’s. Little girls still break their hearts (uh huh): Nothing changed there. Men keep marching off to war (OK, now they stop saying “uh huh” for some reason, but I don’t know why. ): Then it was Vietnam…now it’s the Middle East. How to be peaceful hasn’t been figured out yet. Electrically they keep a baseball score: Well, to say the very least, it was the beginning of a technology that has surpassed any dream we could have imagined with the creation of computers and phones and gadgets that would have “blown our minds” back then. Grandmas sit in chairs and reminisce: Isn’t that what I’m doing now? And don’t call me granny…yet! Boys keep chasing girls to get a kiss: That’s a thread weaved through the entire history of the world, although taken to the next level these days requires ultimate protection. Cars keep going faster all the time: The fastest car today is the SSC Ultimate Aero, an American-made automobile that is produced by Washington-based Shelby SuperCars. It can do 0 to 60 in 2.7 seconds, and was clocked going a record 257 mph by officials at Guinness World Records. (Thank you, Google) In the 60’s it was probably a souped-up Volkswagen Bug – mine was yellow. Bums still cry, “heh, buddy, do you have a dime?”: Bums? Back then you assumed those who panhandled were just too lazy to work – they were called bums. They were guys who laid around campfires in the woods near railroad tracks so they could hop a train on a whim to go somewhere else at any given time. They were considered carefree rovers, eating beans out of cans and carrying their few belongings rolled up in a hankerchief tied to a stick. My father used the term for athletes who weren’t doing well in the game. “Those bums,” he’d yell at the TV. My Mom used to like to call the Phillies bums. I’m getting off point. In this toilet-based economy, there is an overwhelming number of people who just cannot find work because there are no jobs. They are not bums. They are people who are struggling in this economy – unemployed, homeless, down on their luck people who are trying to get back on their feet. The cost of a cup of coffee in the 60’s was a dime. Today it’s at least $1 -2, unless you go to Starbucks and then it would be $5. I would imagine the inflation rate would have ballooned this line to “heh, buddy, do you have a buck or five? Things are a lot different now, and like Bob Dylan sang, “The times they are a-changing,” but that’s another song for another day.